From running 20 kilometres a day to and from school to numerous world records, championships and medals, Haile Gebrselassie has been described by Runners World magazine as "the greatest distance runner of all time", and held 27 world records throughout his career, from 5000 metres to the Marathon. His remarkable career and life is celebrated in the 1999 sports film Endurance, directed by veteran documentarian Leslie Woodhead (World in Action, The Hunt for Bin Laden) and sports documentary specialist Bud Greenspan. Beginning with his early life in Ethiopia where he ran to school barefoot with his books under his arm, the film follows his determined pursuit of Olympic glory and a 10,000 metre final at the Atlanta games of 1996 that would become recognised as one of the greatest races in athletics history. 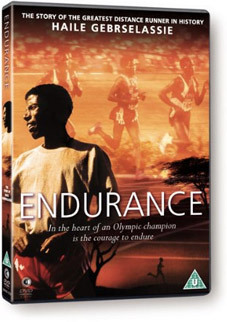 Never before available on UK DVD, Endurance makes its UK DVD debut (in time for the Olympics, of course – expect to see a lot more sporty films released in the next couple of months) on 9th July 2012 from Second Sight Films at the RRP of £15.99. No extras have been detailed on the press release.